VIA Technologies, Inc, a leading innovator of power efficient computing platforms, today unveiled the VIA ALTA DS 2 Android media player.Building on from the success of the first generation VIA ALTA DS, the latest addition brings dual Full HD independent screen support to the VIA Android digital signage media player family, opening up new possibilities for a host of applications ranging from kiosks, POS systems, and menu boards to TVOIP, cloud streaming, and Out of Home Advertising across a broad spectrum of retail, hospitality, education, and entertainment environments. With dual Full HD independent screen support, rich 3D graphics and HD video performance, touch screen support, and compatibility with the latest Android Signage Content Management apps, the VIA ALTA DS 2 is the ideal system-ready solution to power digital signage displays where high performance video and connectivity are paramount for enhanced customer engagement. With an optional Mini HDMI-in port, the VIA ALTA DS 2 can be configured to blend locally-captured real-time video streams with cloud-delivered content to create visually-compelling interactive displays. Powered by a 1.0GHz dual core VIA Elite E1000 Cortex-A9 SoC, the VIA ALTA DS 2 combines high-performance 2D/3D graphics with an advanced video engine that supports Open GL ES 3.0 hardware acceleration and simultaneous multiple HD video playback. The VIA ALTA DS 2 system integrates a rich set of I/O features through the front and rear panels of its ultra-compact fanless chassis measuring just 180mm x 120mm x 25mm (W x H x D). 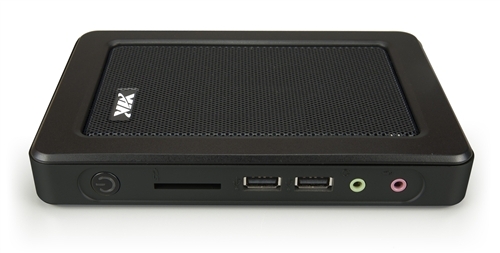 Front panel I/O includes two USB 2.0 ports, one SD Card slot and line-in/out audio jacks. Rear panel I/O includes two HDMI-out ports, one Mini HDMI-in port (project-based support), two Mini USB 2.0 ports, one Gigabit Ethernet port, a Kensington security slot, and one 12V DC-in jack. Onboard features include 2GB DDR3 SDRAM and up to 16GB eMMC Flash memory as well as support for a 2.5” SATA HDD/SSD (project-based support). High-speed wireless networking capabilities are available through an optional 802.11b/g/n USB dongle. Compatible with the latest Android Signage Content Management apps, the VIA ALTA DS 2 is available with a signage software solution pack featuring Android 4.3 as well as the VIA Smart ETK comprising a number of APIs, including Watchdog Timer (WDT) for safeguarding against system crashes, WOL, RTC wake-up, and a sample app. A full set of software customization services that speed up time to market and minimize development costs is also available.